Timing Chains and Specialty tools we can handle it! 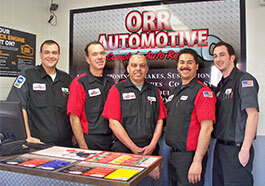 Orr Automotive was started as a 3000 square foot facility with 2 lifts. The continued focus of honesty, Integrity, and fairness have remained with a new focus on efficiency. Deposits accumulate on intake valves, injectors, ports, fuel injectors and combustion chambers causing loss of power, rough idle, hesitation, misfire, pinging, knocking, mileage and hard starting.